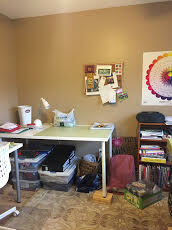 This Monthly Member Spotlight features Chris and her creative space! When brought you to VTMQG? I had just moved to Burlington and thought it sounded like a great way to meet people. When did you start quilting? 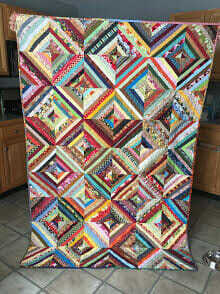 I started quilting in the 90’s. Why do you quilt? I think the first thing that brought me to quilting were the beautiful fabrics. 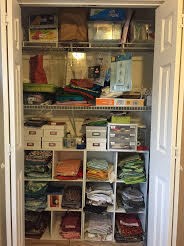 Growing up, my mom sewed a lot of our clothing so I spent many, many hours in fabric stores. I loved going and picking out fabric and looking at all of the beautiful prints and colors. 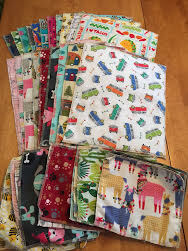 As a kid I was crafty and creative, so once I was old enough to make my own purchases it seemed like making quilts was a natural way to combine many of my interests. I love finishing a project and knowing that I made it, it brings me great joy to share handmade gifts with friends and family. Sewing is also a social activity for me. My mom, sister, aunts, cousins and some friends are avid sewers as well. What was your most recent fabric purchase? A 1/4 yard of Kona Tiger Lily, I only needed a little more to finish my challenge project! What is on your “to make list”? 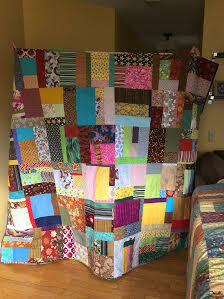 I have ideas for a community quilts that use up some of my stash that I am not crazy about any more. 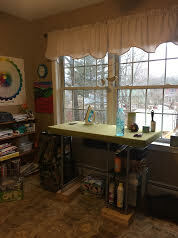 I am interested in making a wall hanging for the bedroom and my table could use a new runner. What is your most useful (or least useful) notion? My rotary cutter-I can’t imagine using scissors to cut fabric! Scrap Buster #1 + #2. Both finally got finished, just in time for snuggling during that horrendous cold snap. 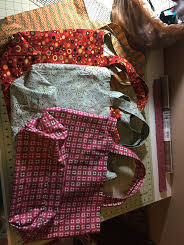 Some lucky friends received grocery bags and “unpaper towels” for holiday gifts this year. Chris, thank you for sharing your space with us. 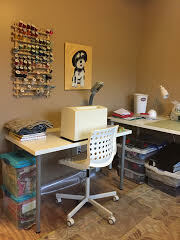 You have such beautiful light coming into your sewing room! Seems like the perfect place to get planning, cutting, and sewing. We look forward to seeing more of your creations! And that’s a wrap for April’s Monthly Member Spotlight. See you next month with a whole new member and a whole new sewing space!